AVA is proud to offer a virtual tour of our LEED Gold-Certified “green” building renovation as an iPhone app, available for free at the Apple iTunes Store by clicking here. The app features audio clips, animations, and a walk-through of AVA’s Carter-Kelsey building, describing the eco-friendly aspects of the 2006-2007 renovation that resulted in LEED (Leadership in Energy and Environmental Design) Gold Certification. 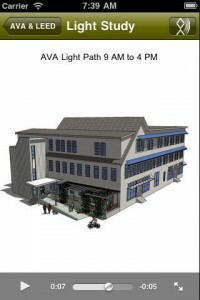 The app also describes the LEED certification process and AVA’s environmental goals. If you don’t own an iPhone, don’t worry – just stop by AVA, and we will loan you an iPod to experience the tour in person! The app was expertly conceived and produced by Barbara Jones and Eric Richardson, who also have created apps for other cultural institutions. 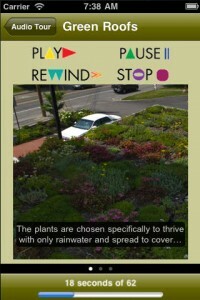 Part of the text was written by Patrick Luteran, a 2010 summer intern and college student who was majoring in sustainable architecture, with additional text written by the renovation’s lead architect, C. Stuart White, and AVA’s Executive Director, Bente Torjusen. New York City-based actors Tim Rush and Brandy Zarle did the narration. The AVA LEED app—which, to our knowledge, is the first app on this subject matter— was made possible thanks to a grant from the Highfield Foundation. The official LEED Gold plaque was unveiled by the main entrance to the Carter-Kelsey Building, followed by a “LEED-inspired” tour. The project’s head architect – C. Stuart White of the Lebanon-based firm, Banwell Architects – talked about the various initiatives and improvements that, together, helped transform this old mill building – formerly known as the H.W. Carter Overall Factory – into one of the most energy-efficient buildings in the Upper Valley. In addition to White, many of the other professionals who contributed to making the AVA renovation a LEED Gold-certified building were also present, including Paul Leveille – AVA’s LEED consultant – of the Jordan Institute in Concord, New Hampshire. The LEED process is a so-called “integrated process,” during which all the involved parties – in this case Banwell Architects, Trumbull-Nelson Construction, all the engineers, consultants and other construction and design professionals, along with AVA’s board, staff and building committee – worked closely together from the earliest planning stages of the renovation (beginning December 2004), to make this project a “green” and sustainable one. The LEED Green Building Rating System™ places emphasis on quantifiable, measurable and documented environmental benefits. The certification criteria are determined by the number of accumulated points achieved within a series of categories established by the USGBC. These categories are: Sustainable Sites, Water Efficiency, Energy Performance and Atmosphere, Materials and Resources, Indoor Environmental Quality, and Innovation and Design. LEED Gold Certification is the second highest rating level awarded by USGBC, which, in its award letter to AVA, stated that the renovation is “a pioneering example of sustainable design.” The project received 47 LEED points, just shy of Platinum rating (which is 52 and over). Ultimately, though, one of the renovation’s main achievements was the recycling of an entire building and the successful combination of historic features with new and contemporary approaches to construction, architectural design and environmental sustainability. These accomplishments have received recognition beyond the LEED certification. In June 2008, the renovation project earned a merit award from Plan-NH. 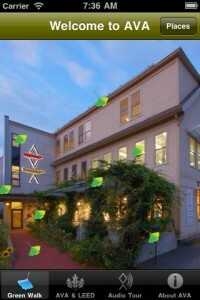 This award is given to “exemplary projects that incorporate the principles of smart growth, sustainability, social responsibility, and employ creative approaches to partnership and collaboration.” In addition, in January 2009, Banwell Architects received a Citation Award from the American Institute of Architects (AIA) – VT Chapter in the Historic Preservation/Renovation Category for the AVA project. The jury specifically emphasized how the architects had “thought through the issues of sustainability and how to integrate it into the existing fabric.” This successful architectural combination of old and new – where the integrity of the building’s past is honored and juxtaposed with contemporary design – makes a visit to AVA’s renovated Eleven Bank Street building a unique and rewarding experience. AVA’s May 2nd celebration was made possible by the generous support of Peter and Jane Kitchel McLaughlin.